Despite proudly wearing the world's longest whiskers, Bucky is very shy at first but when he gets to know you he is a big smooch who loves belly rubs. He is extremely playful and has taken to looking after his foster kitten brothers. He is a lovely soft boy. He is very attached to his sister Bella. Bella is a bit scared and he comforts her. They cuddle up to each other. 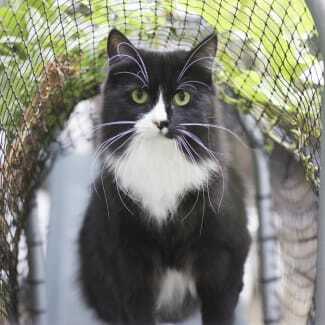 He has been in foster care with kids, other cats and a dog and gets along very well with everyone. 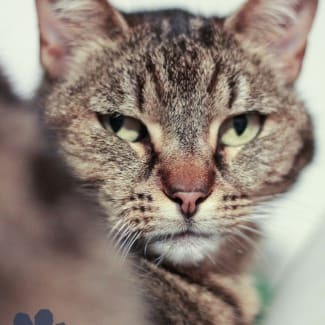 Peppa is a very very sweet old girl who loves pets and cuddles and human contact. She, however, does not like other animals and very young children. She currently lives in a foster home that has other cats and a dog and she is very miserable. she keeps to herself in a laundry, even though she has access to the whole house. She is looking for maybe an elderly person without other animals who will give her the love and attention she deserves and craves.